Ahh, to be young and in Paris. 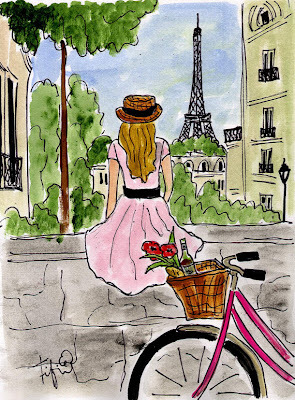 When I was 18 years old and visiting the City of Lights for the first time, I felt like the girl in the pink dress. Romance was in the air and anything was possible. 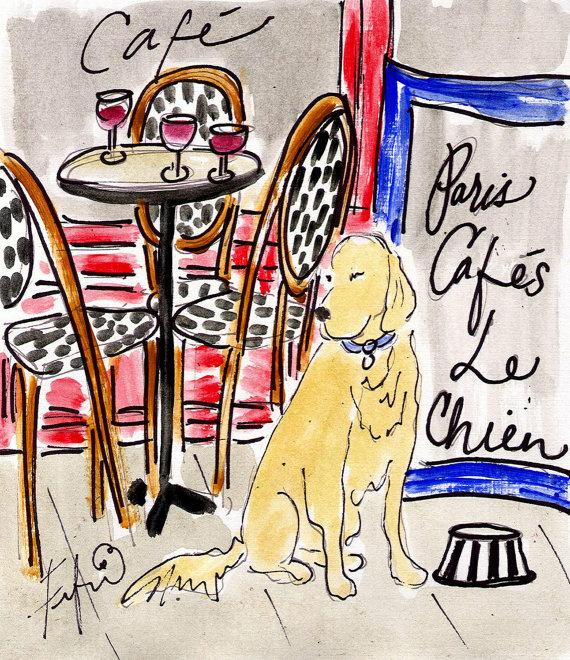 If you would like to give your favorite Francophile the gift of whimsy and fun for Christmas, it's easier than you think. Fifi Flower's colorful paintings, prints, notecards and bookmarks will have you dreaming of long bicycle rides along the Seine, bubbly champagne and pink sparkly shoes. You'll be planning your next Parisian escapade before you know it. Fifi also accepts commissions. If you've always wished that your furry friend could accompany you on strolls through Luxembourg Garden and sit by your side at the café, be sure to take a look at her offer to paint a customized portrait of your dog. For more information, please visit Fifi Flower's Etsy Shop and her official website, Atelier de Fifi. The pink Valentino bow slippers gazing upon the Eiffel Tower--quite nice. FUN!!!!!!!!!!!!!! I've linked this to my Facebook FUN page https://www.facebook.com/pages/Fifi-Flowers/130652110316462 and Twitter!!! And don't think that I forgot...you have some holiday photos coming your way (in The Godfather voice). I adore those pictures. The colours are so alive and there's such character in the drawings. Joseph, It would be hard to say which one of Fifi's paintings is my favorite, but the one with the pink slippers always captures my imagination. 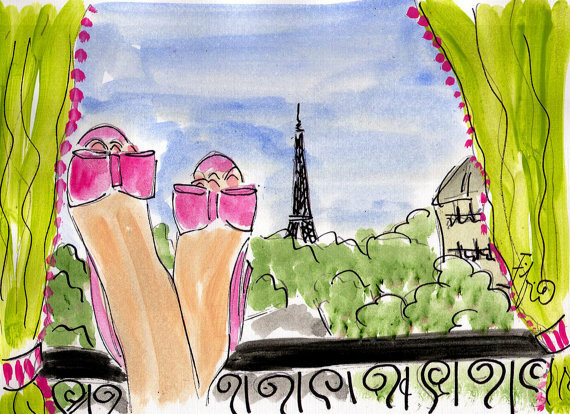 Wouldn't it be great to put your feet up and gaze at the Eiffel Tower without a care in the world? Fifi, Your photos are fun! Thanks for putting the link on your facebook page. Ella, It's amazing how Fifi's pictures always seem to go with your posts, even Oh mon Dieu!. I would love to know the story behind the painting. Steph, Such character - that's the perfect description.